Manny may be the answer the Bravos are looking for! All that and the deepest bench in baseball? You'd still have Diaz, Conrad, Ross and Hinske/Ankiel/Cabrera depending on who started at any given time. Manny has lived in Manny-Land for a long time, but was Deion Sanders much worse? It's not like Bobby hasn't dealt with a head case before and it's not like Manny was always this way. He was quite harmonious with the BoSox back in the day so it's not out of the question for him to actually play baseball. I'm sure a 3rd ring is a mutual interest and 10 out of 10 baseball players say they would love to play for Cox. What better way to send Cox out than pushing all your chips in and picking up the best hitter available? It's not like the Braves haven't done anything ridiculous before when they thought they were in the pennant race. Remember the Mark Texeira deal a couple of years ago? The Braves entire farm system for a half year of Tex who the Braves swore would be likely to stay. The price to pick up Manny would be approximately $5 million for the remainder of the season, much of which could be picked up due to the insurance policies on Chipper and being able to have the remainder of this year's salary being paid by that insurance. What is the true cost to the Braves? 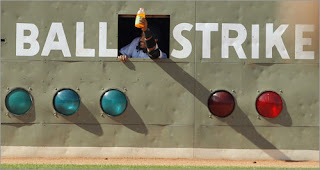 If Freeman isn't ready to be called up, they HAVE to get a bat. 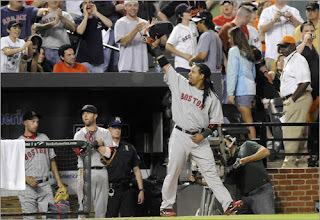 I know the guy has been dubbed a cancer, but with the mutual interests of winning it all, having a manager who has proven he can lead almost anyone, Bobby's final season, a stellar pitching staff, and a legitimate run at the World Series at stake, my vote is for Manny. Let's face it, this guy could honestly get off a plane, show up at the game, not stretch, not even warm up with the ball boy in left, put on a helmet and batting gloves, and absolutely rake. He's not much more of a liability defensively than Diaz and he's going to hit both lefties and righties like it's his job (news flash, that is his job). Head case or not, I'll take the rest of the season with Manny and a final push for the play offs. He could more than make up for the lack of Chipper and be the answer to Ryan Howard, Albert Pujols, and any other slugger the Braves face down the stretch. I'm jumping on the Manny train now! Who's coming with me? Check out Jeff Schultz's blog on the AJC website here. As always, leave some comments and post Sportscrack's blogs on Facebook and Twitter. Comment away, share with your friends, buy a T-Shirt, and let Matt know he's doing a great job. Let's face it, the guy's head really isn't big enough already. "If [Harper] wants to play here, he's going to play here," Strasburg said Sunday, after pitching five innings in the Nationals' win over Arizona. "He doesn't need advice from anybody to convince him otherwise. If he doesn't want to play here, then we don't want him here." Really?!? Is this some kind of a joke? The same kid who held out for a record $15.1 million dollar contract literally SECONDS before midnight on the signing day deadline has room to call out ANYONE on signing day for holding out? Both of them are represented by Scott Boras, who you would think has the brains to shut one of his clients up in the interest of both of them getting more money in the end. 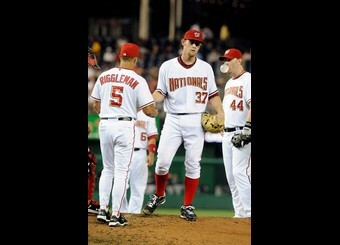 Strasburg has pitched in the majors for all of 2 1/2 months and he is the one from the Nationals calling out Harper? Where is Ryan Zimmerman, the apparent clubhouse leader? How does Strasburg entertain the idea that he has earned the right to call out anyone? For the record, I agree with Strasburg's comments, I just can't see how someone who did the same exact thing a year ago today can justify "pointing fingers" at anyone for holding out and weighing his options for the possibility of being drafted next year by a different team. Maybe the 17 year old Harper wants to develop a little more, maybe he isn't ready, maybe he enjoys college, or maybe this is just one more scam to get Strasburg and Harper's names in the press to further push for the ROY (Rookie of the Year for the baseball illiterate) award for both this year and next year considering Harper has apparently already locked up the ROY, Triple Crown, Gold Glove, and Batting Title for 2011. Who knows, but man, Strasburg must have balls the size of his 100 MPH fastball. I bet they don't even make a cup big enough for that guy. Personally, I think he should just transfer to UGA and play a couple of years. We could use a National Championship in baseball and apparently Harper is a one man team. In fairness, the kid is an absolute STUD (please excuse the man crush). After all, we do have the number 1 rated party school in the country and Harper is only 17 years old. Seems like a good fit to me! Check out the full Associated Press Article posted on ESPN here. PS... Keep it classy kiddos and root for the Bravos tonight. Hanson vs. Billingsley, 7:10 ET at the Ted. Should be a great game! If there is a big time sleeper in college football this season it might just be the North Carolina Tarheels. The Tarheels have the #1 rated defensive end (Robert Quinn), the #1 rated defensive tackle (Marvin Austin), the #1 rated inside linebacker (Quan Sturdivant), and the #1 rated outside linebacker (Bruce Carter) in the nation according to Phil Steele. Now arguments could be made amongst college football fans that any or none of these guys are really the best in the nation (personally I would take Iowa's Adrian Clayborn over Quinn and also Michigan State's Greg Jones over Sturdivant) but there is no doubt the Tarheels are going to have a sick defense. Their front 7 will all be playing in the NFL. North Carolina had the best defense in the ACC last year and they do have 19 returning starters. The question though remains how did a team with so much defensive talent who is also led by a coach with the credentials of Butch Davis only finish 4-4 in conference play? Because the offense was anemic. I saw first hand how bad the offense was when the Tarheels played Georgia Tech at the Flats and they only scored 7 points. Georgia Tech's defense was nothing to write home about. And with the uncertain status of their best offensive player in WR Greg Little (ineligible along with Marvin Austin for the Miami agent party) I wouldn't be expecting an offensive explosion from the Tarheels this season. But can the defense shut out teams? Sure they can. They start off the season with LSU in the Georgia Dome. We should know right away whether North Carolina is a legit ACC contender if they can handle LSU on a neutral field. Their conference opener is two weeks later with Georgia Tech visiting. Tech owned them last year and North Carolina has lost their last 9 conference openers. I have a feeling Paul Johnson is relishing his role as an underdog this season with the Jackets. So right away unless North Carolina brings their A game they could very easily be 0-2 going into a road game with Rutgers. The defense should be fun to watch all season. There will be plenty of hard hits and helmets flying. But North Carolina is not a legit contender for the National Championship game in my opinion. In fact I think they will have a hard time even winning the Coastal Division with Miami, Virginia Tech, and Georgia Tech all returning experienced quarterbacks who are elusive and can scramble against their blitzing defense. Prediction: The Hokies win the Coastal Division and the ACC. North Carolina finishes 5-3 in ACC play with losses to either GA Tech, Clemson, Miami, FSU, and Virginia Tech.